Regular maintenance of any door is important to ensure its long life and aesthetic appearance. Regardless of the materials used in its construction, all doors should be cleaned regularly, followed by a thorough rinse to ensure that no soap residue remains to degrade or discolor the doors finish. As part of this cleaning, a visual inspection of the door for loose screws, hinges, weather stripping, and locks should be done. Most problems discovered during this inspection can be corrected with just a screw driver. This would also be a good time to use a quality graphite lubricant on the lock mechanism as well. While the vinyl or baked enamel finish of a steel door will require little more maintenance than what has already been described, wooden doors do have additional requirements. Wood doors can take as much as a year to stabilize after installation, adjusting to the temperature and humidity of the environment. During this period, shaving material from an edge of the door as swelling occurs may be required. Each time the door is trimmed, make sure to apply a new finish to the trimmed area and a good sealer to keep additional moisture from being absorbed. During a wooden doors cleanings, you should also check to see if it needs to be refinished as well. When there are dull areas of the finish, a raised grain, or minor surface checks can all be a sign that the finish should be restored. 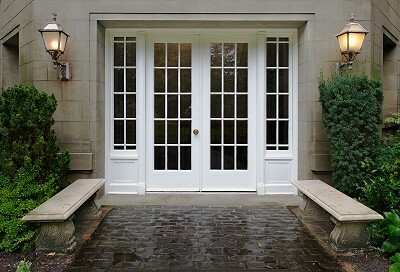 Doors that are exposed to sun and rain can take on a whitish cast, indicating that the finish is weakening. Also, check for dark streak at the bottom of any panels that indicate moisture is affecting the wood. Fiberglass doors are more resistant to moisture that wood doors, but still require regular cleaning and either painting or staining periodically. Cleaning is the top priority when it comes to patio doors, most importantly make sure to vacuum the track area the patio door rides in. You may also need to lubricate the lock mechanism of the patio door occasionally.